There is one thing every painter must do and this is to know his environment ….. and achieve a proper balance between the technical means and the emotional expression. Carl Schaefer, a Canadian regionalist artist and teacher, painted scenes of rural southern Ontario. The farm environment of Grey County and his personal relationship to the land inspired his best work. Schaefer studied at the Ontario College of Art from 1921 under the Group of Seven painters, Arthur Lismer and J.E.H. MacDonald. He later free-lanced as a commercial artist. In 1930, Schaefer began teaching at the Central Technical School in Toronto. During the Depression, Schaefer returned with his family on his holidays to Hanover. From 1948 to 1970, he taught at OCA (Ontario College of Art). In his earliest works, Schaefer showed a great interest in such Northern European sixteenth century painters as Pieter Bruegel. From 1932-42 his work was marked by a transition from a decorative/ geometric style to a realistic, occasionally allegorical approach to landscape and still life. In 1937, stimulated by an interest in drawing, Schaefer turned to watercolour, a medium that had the added advantages of speed, immediacy, and low cost. 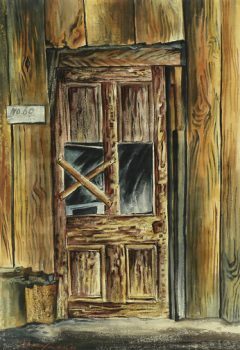 From 1943-46, Schaefer worked as an official war artist with the RCAF (Royal Canadian Air Force). 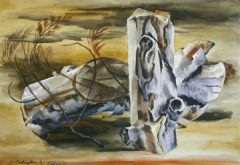 This experience darkened his vision, but by the 1950s he was again painting in a broad, lyrical spirit in the countryside around Hanover and in neighboring Wellington and Waterloo counties. During his lifetime, Schaefer was the recipient of numerous awards and honours. Born in Hanover, Ontario, son of John D. and Mamie Fellman Schaefer. Both sides of his parents’ families came from Germany. On his father’s side, his ancestors were close to the land, farming for several generations. His grandfather Schaefer was given Crown Grants in Bruce County, Upper Canada, in the 1840’s and 1850’s and cleared the land with the first Crown Grant and built a log house with the second. Carl’s father was born there and inherited the homestead, worked it, sold it, and with his wife Mamie, moved to the outskirts of Hanover where Carl was born. His mother died when he was five. He then went to live with his mother’s parents, the Fellmans. His grandfather Fellman was a skilled furniture finisher and one of the founders of the furniture factory in Hanover where the Fellman family had settled. From his Fellman grandparents he received love, good food and common sense by his observance of their day to day living and by their guidance throughout his development. He helped his grandfather in the finishing process of furniture and gained valuable practical experience and learned the values in good workmanship. His father bred, raced and showed horses. Carl accompanied his father on the racing and showing circuits and learned more about the outside world (not taught in schools). When his father remarried, Carl stayed on with his Fellman grandparents but was also close to his father and stepmother. At school he enjoyed English, history and geography but not arithmetic. He did nothing special during his art classes to indicate what his final direction would be. 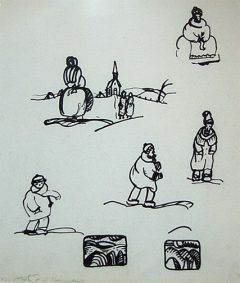 He did drawings in his notebooks especially from his imagination. After two years in high school he decided to enter an art school for formal lessons in drawing. His family gave him some financial help but he had to make up the difference by working part time. He chose the OCA because he had seen a Group of Seven exhibition in which two of the group members, J.E.H. MacDonald and Arthur Lismer, were instructors at the College. From both of these men he learned a great deal. MacDonald stimulated his interest in literature and Lismer recommended art books and other literature to expand his horizons. He also became a lifelong friend of MacDonald’s son, Thoreau. Through MacDonald he also met A.Y. Jackson at the Studio Building and other members of the Group. Two other instructors were also his favourites, C.M. Manly and Robert Holmes. In 1924 he left the OCA having received general art studies and intellectual stimulation from his teachers coupled with a self-teaching programme in drawing and painting. He gained, as well, the practical experience of helping in the decoration of St. Anne’s Church in Toronto where J.E.H. MacDonald was in charge of the mural work being done by 13 artists. He gained further work experience at Hart House where he was hired with other students to make stage sets and scenery for the Theatre and later did similar work for Royal Alexandra Theatre, the Princess Theatre and the Grand Opera House. Returning home to Hanover in 1924, he held his first solo show of 15 oil sketches in the Fireman’s Hall. The local paper gave him a warm review. He returned to Toronto where he did a wide variety of freelance work including: the decoration for the foyer of the Claridge Apartments from a design by J.E.H. MacDonald; assisted sculptor Emmanuel Hahn for his large bronze statues of Ned Hanlon and Sir Adam Beck and later posed for Hahn in making the design for his figures of Hanlon and Beck for the first silver dollar; he made architectural models; more stage sets and scenery for Toronto theatres; did church decorations throughout southern Ontario and commercial sign painting. He set up his own studio in 1925. He continued to do many different jobs, even laying gold leaf over decorations. He was regarded as an artist who could tackle any job. When doing jobs for Brigden’s printing company he first met Charles Comfort who had worked for Brigden’s in Winnipeg before moving to their offices in Toronto. Their association continued throughout their careers. He assisted Comfort with his mural for the North American Life Assurance Company, and Comfort painted Schaefer’s portrait on three separate occasions, Young Canadian (1932), Flight Lieut. Carl Schaefer R.C.A.F. (1948), Carl Schaefer at Bond Head (1973); also a portrait of him in bronze (1972) by Elizabeth Bradford Holbrook was acquired by the AGO. He continued with his personal art while doing his freelance jobs to put food on the table. He made his first painting trip to the French River in 1926 with a former student from the OCA, Lowrie Warrener. In 1927 he married Lillian Marie Evers and made his permanent residence in Toronto. 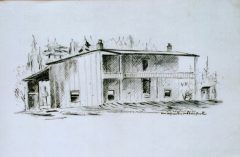 He returned to Northern Ontario again with Warrener and George Pepper on an extensive sketching trip until October. 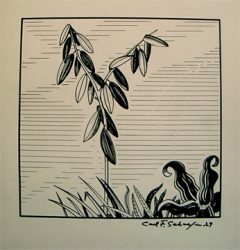 His work in this period is strong in design and form and some of these sketches were developed into his prints and drawings (from 1923 to 1945); he made 45 prints including linocuts, wood engravings, dry point, lithographs and even a stencil. 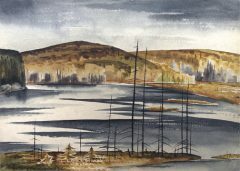 Few of his early landscapes of northern Ontario have been reproduced in art publications with the exception of the retrospective exhibition catalogue of his work (1969). J. Russell Harper organized this show for SGWU, then it went on tour to the AEAG, AGH, LPL&AM (LRA & Hist. Mus.). 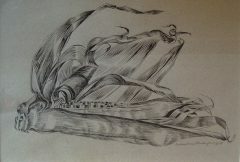 Harper edited the catalogue in which the reproduction of the ink drawing Northern Night, Pickerel River (1932) was reproduced. In another book, Carl Schaefer, by Gray, Rand and Steen, published by Gage (1977), two reproductions appear, Storm Over Tyson Lake (1927) and Sunlit Island (1932) both done in pen and ink. In 1929 he had been hired as a display designer with the T. Eaton Company but when the Great Depression struck, Eaton’s had to let him go. Peter Haworth, head of the art department at the Central Technical School in Toronto had him taken on staff as part-time instructor. But his income was not enough to sustain a family of three, his son Mark having been born in 1929. He moved with his wife and son back to Hanover to live for the summer with his grandparents. But once in Hanover he began to look around at his native countryside with an artist’s eye. He realized he had found the subject matter that he wanted to explore for the rest of his life. From time to time he would paint further afield but most of his attention would be focused on the countryside of rural southern Ontario. His India ink drawing, House at Barrie (1932) is a most successful work with all the elements of a rural setting, a neatly defined house with picket fence, trees, and an expressively defined sky decorated with patterns of clouds and open spaces of sky. A little later the oil paintings, Summer Harvest, Hanover (1935) and Wheat Field (1936) both in NGC, and the dramatically impressive, Storm over the Fields (1937) AGO, are typical subjects he would portray with weather and seasonal variations. In 1933 his second son, Paul was born. In 1934 he was appointed instructor for the Canadian Recreation Institute at Lake Couchiching, Ontario, and director of art at Hart House, U of T. and held both of these jobs until 1936. In 1935 he was also appointed director of art, Trinity College School, Port Hope until 1937(and later 1942/1946-48). By then he had become a member of the following societies: CSGA (1932); CSPWC (1933, Pres. 1938­41); CGP (1936). He was awarded a Guggenheim Fellowship and spent a year in Norwich, Vermont (1940-1). During this period he painted a number of works including February Thaw, Norwich, Vermont (1941) NGC and was able to use presses for printmaking under supervision of Ray Nash at Dartmouth College nearby. After the year was up he returned to teaching at Central Technical School and other teaching duties. He was commissioned by J.S. 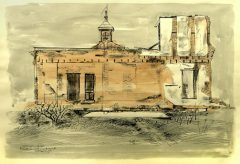 McLean to do a series of six paintings on the war effort for Canada Packers and drawings and paintings of war production for the John Inglis Company. His half-brother, a pilot in the RCAF was killed in December 1941; the war had suddenly taken a life of someone close to him. He was invited by Harry McCurry to become a war artist, he accepted. At the age of forty, he joined the RCAF in February of 1943 and was commissioned with the rank of Pilot Officer (later F/L, July/44). He shipped overseas in March of that year on the S.S. Manchester Trader in a 92-ship convoy of which 22 ships were sunk by enemy action. Aboard ship he began his work as a war artist and painted one of his most successful water colours of that period, North Atlantic Convoy, Version II (now in the collection of A.E. Ames & Co. Ltd). It is a view from the starboard side of a ship in choppy seas, the deck on an upward angle as the bow cuts through the swell on its course for Britain. On the horizon, ships of the convoy also ply their way through the water, as a distant aircraft flies cover overhead looking for enemy submarines. After 16 days at sea Schaefer was assigned to RCAF H.Q. Air Staff in London as Official War Artist. During his service he covered operations in the European Theatre of War and Iceland. He was assigned to operations with nine different Squadrons including Fighter Command, Heavy Bomber Group during the battle of Hamburg, Battle of the Ruhr, and the Battle of Berlin. He painted scenes of the Tactical Air Force training, Bomber Command and Coastal Command, the latter in Northern Ireland. Later he painted in Iceland and was at Reykjavik on VE Day. He produced 129 paintings and drawings, 127 listed in the Canadian War Museum Collection, Ottawa. George Johnston, himself a serviceman, back from West Africa in the fall of 1943, visited Schaefer at Lincolns Inn Fields and noted of his work, These were paintings of aeroplanes and aerodromes. It was hard to imagine that the painter of the rural pictures could have turned himself into a war artist, but he became one of the most competent His aeroplanes are full of the power of flight. As in his Hanover pictures, his chief interest was human. He saw the aeroplanes as their crews saw them, and he was already at home with the crews because they were transplanted ordinary Canadians like himself, and he is naturally a good fellow. He became a part of the life, flew as often as he could and made many good friends. He put more figures into these pictures than he had into his landscapes though he still treated them warily, and he widened his interpretative powers to take in the more dramatic moods of exhilaration and fear and to suggest even the sort of desperate boredom that belongs to wartime flying. Back in London, Schaefer was wounded and suffered shock from the explosion of a buzz bomb which collapsed the pub in which he and fellow Canadian war artists, Pepper, Beament and Law were gathered during a day of respite from their duties. When the air partially cleared they found themselves to be the only ones alive besides another couple half buried in the rubble. Two of his most reproduced war paintings are Marshalling Lancasters Against Stuttgart (1943) and Bomb Aimer C Charlie, Battle of Rhur (1944). After completing his paintings in Canada he was discharged at Lachine, Quebec in 1946. He returned Toronto to continue his career as an artist and teacher. He was appointed instructor, summer session School of Fine Arts, Queen’s University, Kingston, Ont. (1946-50); part-time instructor, Central Technical School (1947-48); Instructor, OCA, 1948, where he became director of dept. 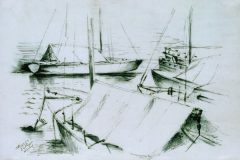 of drawing & painting in 1956, until his retirement in 1968; he then became chairman emeritus of the OCA department of painting (1968-69). He taught at the Schneider School of Fine Arts at Actinolite, Ont., summers (1967)(1968); Sunbury Shores Arts and Nature Centre, St. Andrews, NE, summer, 1968 in cooperation with UNE. He once stated, My personal view is that all art is abstract, and I am forever impelled to express myself through the use of symbols; to identify myself with the humanistic and the intimacy of the world of nature. Art must have organic structure and meaning, and it must grow as it were, out of, and according to the laws of nature, and be expressed with a communicable simplicity. Schaefer continued painting, and in the 1980’s many of his paintings were collected for a show, Canadian Landscapes, that toured many European cities from 1983 to ’85. His honours include: Canada Centennial Medal (1967); Hon. Mbr., Senior Common Room, Trinity College, U of T(1974); Doctor of Letters, honoris causa, U of Waterloo (1976); fellow, OCA (1976); fellow, RSA, Lond. Eng. (1977); Order of Canada (1978). Carl Schaefer died in 1995 at the age of 92. He was predeceased by his wife, Lillian. He is survived by his sons, Mark and Paul, five grandchildren and three great-grandchildren. He held many solo shows throughout his career including: Picture Loan Society, Tor. (12 shows, 1936-58); AGT (AGO), 2-artist retrospective, (1954); Roberts Gallery, Tor. (1963); UWO, Lond., ON (1964): SGWU, Mtl. (1969 touring 1970 – AEAC, AGH, LPL&AM, AGW); Show arranged by Robt. McL. Gal., Oshawa, Retros.1932-1967 (1976 touring); TTMG, Owen Sound (1979). Organized solo by EAG, Edn. tray. Show (1989). He is represented the following collections (partial listing): NGC, Ott. ; Can. War Museum, Outaouais, PQ/Ott.,ON; Dept.External Affairs, Ott. ; AGO, Tor. ; TTMG, ON; AGW; AGH; AGV; CIBC; CCAB, Ott. ; HH,UT; Univ. Coll. UT; Upper Can. Coll., Tor. ; AEAC; Pickering College, Newmarket, ON; Dalhousie U, Hal., NS; LRA & Hist. Mus., Lond., ON; Ridley College, St. Catharines, ON; CU(SGWU), Mtl. ; MacIntosh Memorial AG, UWO, Lond., ON; Rodman Hall AG, St. Catharines, ON; Glenhyrst Arts Council, Brantford, ON; Royal Bank of Can. ; OAC, MacDonald Inst., U of Guelph, ON; Dartmouth Heritage Museum, NS; Dartmouth College, Hopkins Center AG, Hanover, N.H., USA; A.E. Ames & Co., Tor. ; Shell Resources Can., Calgary, AB, and in the collections and estates/bequests of many VIPs, Royalty, and over fifty other private collectors. Memorial University, St. John's, Nfld. Carl Schaefer was Director of the Drawing and Painting Department at the Ontario College of Art, 1956-70.